It is said that all life in this world began on Despair, and over the centuries the various species migrated across the waters to new homes. Certainly still the most densely inhabited land, it is considered by local scholars to be the most advanced society of the known world. -- ZombieCity: If Despair is the motherland of the world where life began, the grounds beneath ZombieCity is where it all truly started. Archeaolgical digs beneath the city streets have found evidence that the city itself has existed far before recorded history. It is the epicenter of all trade within the world and bustles with life at all hours of the day. It is said that ZombieCity hasn't slept in well over a millennium. -- Dragon Isle: So named as it is the home of one of the last great breeding colonies of lesser dragons. Visitors tell fabulous tales of glimsping these great beasts soaring high in the skies above. The wise Monks who have taken up residence on the island simply nod at these stories and smile mysteriously. -- Darkwater: A small, yet prosperous village located in the frozen far north, rumour has it that this area is surrounded by a strong wall of magic, keeping out the bitter cold and allowing lush vegetation to grow. -- Maestar: One of the largest regions of the land, Maestar once held a vast amount of power within Despair. Tragedy has since befallen its enhabitants, as they were struck down mysteriously and cursed to roam the lands as frozen shadows. All who enter Maestar's realm should be wary, and hold respect for these tormented dead. -- Castle Greenlight: A large castle dominating the hostile north of Despair, a place many an undead calls home. -- Hor: Plagued by goblins, this small human village exists on the fringe of society. -- Towanda: Ruled by an Emperor, the region of Towanda lives under the tight control of Centurion forces, but tales of illicit dealings within the region lead to much mistrust between other cities and Towanda itself. -- Varalor: A small merchant's village is the center of the lands of Varalor. -- Concordia: The much respected royal court of Castle Concordia, lead by King Andrew, rule the Concordia region with a just and fair hand. ZombieCity itself lies along the outer boundary of the Concordian lands. -- Uhruul: The underground capital of the Dwarven Kingdom, which stretches to the highlands in the north, and southward through vast mines. -- Tyrir: Controlled by Lord Borgan, the castle of Tyrir towers above his domain. In the surrounding lands, various encampments can be found; everything from common orcs to the unusual rock men, as well as an enchanted labyrinth. -- Highlands: Rising above the dismal swamps of Damorra, the Highlands are verdant green and full of life and legend. Territoral disputes between two warring clans have caused strife in the area for several decades now. -- Savannah: Great grassy plains stretching as far as the eye can see form the Savannah regions. While some villages have managed to prosper here, many an unwary traveller has met his end tangling with some of the local wildlife. -- Damorra: Murky, subtropical swamplands make up the region of Damorra. Legions of Toadmen have populated this land for centuries. -- Terray: A thriving craft community within the small village has kept visitors from all lands coming to Terray for decades, and tales of a great moving castle which roams the land are told by travelling bards who beat out their songs on a strange shaman's drum. Long ago, when the first sturdy ships were fashioned to explore the seas, Cantador was discovered much to the amazement of the population of Despair who had for so long believed their land was the alone in the world. The continent itself is lush with wildlife and wealthy with raw materials beneath the soil. Its trade with Despair has brought great wealth to both continents. -- Ravenkall: Sister in trade with ZombieCity, Ravenkall is the heart of Cantador. -- The Mines: Deep tunnels within the lands of Cantador, once purely a mining operation, distrubing tales have been surfacing from the mines over the past few years. -- The Forest of Anar: One of the more unusual flora subspecies of Cantador lies concentrated here, within Anar. The trees themselves, tho rooted to the soil are very much alive and must be treated with the utmost caution. -- The Temple of Teros:	A site of pilgrimige for many a follower, the legendary temple of Teros lies entwined deep within these southern jungles. -- Ironledge: The icy mountain fortress of Ironledge and its surrounding church and hospital make up the home of those Knights who fight in the Holy Name of the White Goddess, Silvain. The watery mother, the Great Ocean spans all the way from Despair to the distant lands of Mellarnia. -- The Roost: Little more than a nesting grounds for sea birds, the Roost is believed to be uninhabitable by most due the lack of fresh water. 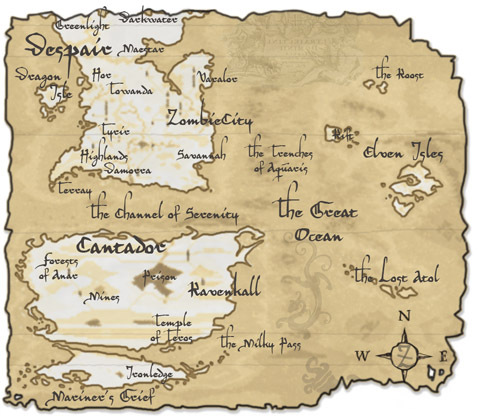 -- Elven Isles: The discovery of the Elven Isles by adventurous seafarers was celebrated throughout the land. Their lush, tropical delicacies and unusual wildlife are prized fare in the royal courts of Despair. These remote islands are now used as a stepping stone for explorers who wish to head to the frontiers of Mellarnia and beyond. Upon the islands lies the ancestral homeland of all elves, the great forest of Eliendien. -- The Great Rift: Chanced upon by explorers, this gash has reportedly been torn between our world and another by a great force. It is said that those who enter never find their way out again, and that no traveller who values his own skin should make their way here. -- The Lost Atol: Until recently, this entire chain of islands was located several meters below sea level. A series of Earthquakes helped to lift these lands to their present position. -- The Trenches of Aquaris: A line of deep sea trenches off the eastern shores of Despair all the way down to Cantador which are said to be the residence of the God Aquaris herself. -- The Channel of Serenity: The fair waters of this large channel between Despair and Cantador are a blessing which allow this passage to be navigated regularly by merchant ships delivering goods between the two lands. -- The Milky Pass: Named after its icy and often half frozen waters, the pass itself seems to flow with white milk as snows settle atop the freezing sea. When navicable, the pass is a godsend allowing sailors to avoid the treacherous Mariner's Grief. -- Mariner's Grief: Choked with icebergs and jagged rock beneath the shallow waves, more lives have been lost at sea to the Grief than any other body of water.